Intestinal Parasitosis In Human Immunodeficiency Virus (HIV) Infected Adults With Chronic Diarrhoea At Jos University Teaching Hospital, Nigeria. A Ibrahim, E Ikeh, A Malu, E Okeke, J Damen. Intestinal Parasitosis In Human Immunodeficiency Virus (HIV) Infected Adults With Chronic Diarrhoea At Jos University Teaching Hospital, Nigeria.. The Internet Journal of Parasitic Diseases. 2006 Volume 2 Number 1. Objective:	To determine the prevalence of intestinal parasitosis in HIV infected adults with chronic diarrhoea at Jos University Teaching Hospital, Nigeria. Method: A total of 101 single stool specimens from adults (≥15years) who tested positive to HIV by double ELISA, confirmed by the Western blot technique and who presented with chronic diarrhoea of over four weeks duration were examined using direct wet mount, formol-ether and modified Ziehl Neelsen techniques. Relevant history and physical examination was carried out on each of the recruited patients and the nutritional status was assessed using the anthropometric measurements (weight and height for age and Biomass Index). Results: Sixty-seven of the patients were positive for intestinal parasitosis, giving a prevalence of 61.4%, while 13.9% had polyparasitism. The prevalence of the individual parasites were as follows: Cryptosporidium parvum (16.83%), Enterocytozoon bieneusi/Encephalitozoon intestinalis (8.91%), Cyclospora cayetanensis (1.98%), Isospora belli (0.99%), Entamoeba histolytica (9.90%), Giardia lamblia (1.98%), Hookworm (10.98), Trichuris trichiura (5.94%), Ascaris lumbricoides (2.97%), Strongyloides stercoralis (1.98%), Schistosoma mansoni (3.96%) and Dicrocoelium dendriticum (4.95%). Candida species (a yeast) was detected in 9.90% of the patients without any intestinal parasite. Males recorded a prevalence of 61.4% as against 70.2% in females (P>0.05). The age group of 15-24 years was the most significantly infected (P<;0.05) with a prevalence of 83.3%. There was no significant difference in the prevalence of intestinal parasitosis in relation to the occupational status, marital status, duration of diarrhoea and presence of organomegaly (P>0.05). Conversely, there was a significant difference in relation to Biomass Index and frequency of diarrhoea (P<0.05). Conclusion:	This study has shown a very high prevalence of intestinal parasitosis in HIV-infected adults with chronic diarrhoea and that the coccidian parasites which are not routinely searched for in most centres probably accounted for 29.0% of the diarrhoea in the study population. In general, diarrhoea may result from poorly absorbable osmotically active solutes in the intestinal lumen (osmotic diarrhoea), active ion secretion (secretory diarrhoea), deranged intestinal motility, altered mucosal morphology or loss of absorptive surface or a combination of the above mechanisms (1). Gastrointestinal diseases particularly diarrhoea, is the commonest presentation of Acquired Immune Deficiency Syndrome (AIDS) in Africa. Diarrhoea occurs in nearly 90% of patients with advanced Human Immunodeficiency Virus (HIV) infection in Central Africa compared with 30% to 60% in developed countries (2). Chronic diarrhoea is a very common presentation of HIV infection in Nigeria (3,4,5) with a prevalence of 61% (3). Diarrhoea in patients with HIV infection may be attributable to a number of conditions which include infection with conventional and opportunistic microorganisms (6, 7), enteropathy (8), malignancy and even treatment with various agents. Thus, HIV related chronic diarrhoea has a multi-factorial aetiopathogenesis with enteric parasites possibly playing a prominent role. Various microorganisms have been isolated from HIV-infected patients with chronic diarrhoea either singly or in combinations. These include bacteria, viruses and parasites, notably protozoa (7, 9,10,11,12,13). The objective of this study was to determine the prevalence of intestinal parasites and their association with chronic diarrhoea in HIV-infected adult patients at Jos University Teaching Hospital, Nigeria. This was a case controlled hospital based study of intestinal parasites in HIV-infected adults with chronic diarrhoea at Jos University Teaching Hospital, Nigeria from June 2004 to September 2005. The study population consisted of 101 adults (≥15years) who tested positive to HIV by double Enzyme Linked Immunosorbent Assay (ELISA) and were confirmed by the Western blot technique and who presented with chronic diarrhoea of over four weeks duration. Chronic diarrhoea was defined as three or more episodes of loose stool passed daily for more than four weeks. Patients who were confirmed HIV positive but did not present with chronic diarrhoea; those on specific antihelminthics or who had any treatment for intestinal parasitism in the last two weeks preceding specimen collection and those who had antacid, bismuth salts, laxatives and/or gastrointestinal contrast media in the last two weeks preceding specimen collection were all excluded from the study. Relevant history was taken from each recruited patient and physical examination was carried out on each of the patients as well. A total of 101 single stool specimens were collected in wide mouth clean plastic containers from the recruited patients. The faecal samples were subjected to direct wet mount and Formol-ether concentration method as modified by Allen and Ridley (14). Smears were also made from each of the samples and stained by the modified Ziehl Neelsen's method (15) for the coccidial parasites. The results obtained were subjected to Chi-square (χ2) statistical analysis at a level of significance of P = 0.05. 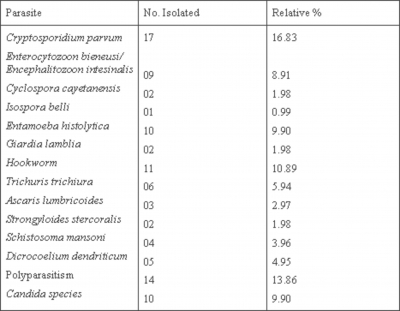 The demographic data and relative prevalence of the intestinal parasites in the patients are shown on Table I. Sixty-seven of the 101 patients were positive, giving a prevalence of 66.3%, while 13.9% had polyparasitism. In relation to gender, males recorded a prevalence of 61.4% while the females had 70.2% (χ2 = 0.6260; P>0.05). The age group of 15-24 years was the most significantly infected with a prevalence of 83.3%; while 25-34, 35-44, 45-54 and ≥ 55 years recorded 71.1%, 60.0%, 33.3% and 0.0% respectively (χ2 = 89.4169; P<0.05). Table 1: Demographic Data and Relative Prevalence of Intestinal Parasites in HIV Adult Patients with Chronic Diarrhoea in Jos University Teaching Hospital, Nigeria. There was no significant difference in the prevalence of intestinal parasitosis in relation to the occupational status of the patients (χ2 = 2.4398; P>0.05). The artisans and students recorded the highest prevalence of 81.0%, while civil servants, housewives, unemployed, medical workers and long-distance drivers recorded 56.4%, 70.0%, 50.0%, 75.0% and 66.7% respectively. In relation to marital status, the unmarried patients had a prevalence of 71.4%, while the married patients recorded 63.6% (χ2 = 0.3703; P>0.05). There was a significant difference in the prevalence of intestinal parasites in relation to the Body Mass Index (BMI) (χ2 = 4.3172; P<0.05). The patients with normal weight recorded a higher prevalence of 84.6% compared with 60.0% in underweight patients. There was a significant difference in the prevalence of intestinal parasites in relation to the frequency of diarrhoea per day (χ2 = 9.3061; P<0.05). Patients who had a prevalence of ≥ 7 times had a prevalence of 100%, while those with 1-3 times and 4-6 times recorded a prevalence of 71.4% and 64.0% respectively. With respect to the duration of diarrhoea, there was no significant difference (χ2 = 4.2141; P>0.05). Patients who had been having diarrhoea for 2, 3, 4 and ≥ 5 months recorded a prevalence of 62.8%, 69.7%, 69.6% and 50.0% respectively. There was no significant difference in the prevalence of the intestinal parasites in relation to organomegaly (χ2 = 0.4167; P>0.05). Those with splenomegaly recorded 53.8% as against 45.5% in those with hepatomegaly. Table 2 shows the prevalence of the individual parasites. Table 2: Prevalence of Intestinal Parasites in HIV-Infected Adult Patients (n = 101) with Chronic Diarrhoea at Jos University Teaching Hospital, Nigeria. Cryptosporidium parvum recorded the highest prevalence of 16.83%. The other parasites and their prevalences are Enterocytozoon bieneusi/Encephalitozoon intestinalis (8.91%), Cyclospora cayetanensis (1.98%), Isospora belli (0.99%), Entamoeba histolytica (9.90%), Giardia lamblia (1.98%), Hookworm (10.89%), Trichuris trichiura (5.94%), Ascaris lumbricoides (2.97%), Strongyloides stercoralis (1.98%), Schistosoma mansoni (3.96%) and Dicrocoelium dendriticum (4.95%). Candida species (a yeast) was detected in 9.90% of the patients without any intestinal parasite. This study has shown a very high prevalence of intestinal parasitosis in HIV-infected adult patients with chronic diarrhoea at Jos University Teaching Hospital, Nigeria. This prevalence rate of 66.3% is similar to the 50%-80% found by Ramakrishma in Vellore, India (16) and 62.6% found by Tarimo et al (17) in North Eastern Tanzania. The prevalence in this study is higher than that by Merlin et al (18) in Argentina that recorded a prevalence of 52.3% in HIV patients with chronic diarrhoea and the 51.9% obtained by Awole et al (19) in South Western Ethiopia. It is also higher than the 48.2% obtained at the same Jos University Teaching Hospital in 2000 by Keptcheu et al (9). The 16.83% prevalence of Cryptosporidium parvum infection in this study is consistent with the 20% and 22% ranges recorded by Valasquez et al (20) in Argentine AIDS patients with chronic diarrhoea, although a higher prevalence was obtained in studies using jejunal biopsies (21). On the other hand, a few studies in Nigeria (22, 23) did not detect C. parvum, and this is surprising as this coccidian parasite has even been found in the faeces of apparently healthy persons by Ikeh et al (24) in their study in North Central Nigeria. Enterocytozoon bieneusi/Encephalitozoon intestinalis infection that had a prevalence of 8.91% has been shown by various authors to be associated with chronic diarrhoea in AIDS patients (11, 20, 25). Also, C. cayetanensis infection that recorded a prevalence of 1.98% has been associated with diarrhoea in AIDS patients (26). Isospora belli with a prevalence of 0.99% in this study has similarly been associated with chronic diarrhoea in AIDS patients (27). The coccidian parasites (C. parvum, I. belli, C. cayetanensis, E. bieneusi/E. intestinalis) accounted for 29.0% of chronic diarrhoea in this study and thus, efforts should be made to routinely search for these parasites in this category of patients. Although, cryptosporidiosis and microsporidiosis have been reported in immunocompetent patients, diseases caused by these parasitic agents are much more common in the immunocompromised hosts (24, 28). The intestinal helminths that were detected in this study are similar to those that were reported by Keptcheu et al (9) and Nwokediuko et al (23). Both studies had shown that there might not be any relationship between intestinal helminths and diarrhoea in HIV infections. Tarimo et al (17) in Tanzania detected similar spectrum of helminths, but concluded that only the protozoa in that study could have accounted for the chronic diarrhoea. The eggs of Dicrocoelium dendriticum that were detected in the faecal samples were confirmed cases of spurious parasitism due to the frequent consumption of liver diets by the AIDS patients to improve their nutritional status. The detection of large numbers of Candida species in the absence of any parasitic intestinal pathogen might be suggestive that Candida species is an aetiological agent of diarrhoea in AIDS patients. The proliferation of Candida species in the intestinal tract might be due to the frequent use of broad spectrum antibiotics to stop or reduce the recurrent diarrhoea. The high rate of polyparasitism encountered in the study could be due to the depressed immunity in the patients, coupled with the increased habit of trying to consume vegetables and fruits which may not be adequately washed. Our study has indicated that there is no positive relationship between intestinal parasitosis and gender, occupational status, marital status, duration of diarrhoea and organomegaly (P>0.05). On the contrary, there is a significant difference in the prevalence of intestinal parasitosis in relation to the age groups, BMI, and frequency of diarrhoea per day. Patients within the age groups of 15 years to 44 years were more significantly infected. This is expected as this is the sexually active group who are more likely to acquire HIV infection. Patients with normal BMI were more significantly infected than the underweight patients. This might be attributed to the reason that the patients with normal BMI were still stronger than the underweight patients and so they are more likely to be exposed to these parasites. On the contrary, the underweight patients may be too weak to help themselves and so the care-givers do most of the house chores for them. They are therefore, less exposed to parasitic infections compared to the normal weight patients. In conclusion, this study has shown that the coccidial parasites, which in most cases, are not routinely searched for in the diarrhoeic faecal samples, were responsible for some of the chronic diarrhoeal cases in HIV infected patients. 1. Krejs, G.J. Diarrhoea In: Wyugaarden, J.B.; Smith, L.H. Jnr; Bennett, J.C. (ed). Cecil Textbook of Medicine 19th Edition: Philadelphia W.B. Saunders Company, 1992; 680-687. 2. Colebunders, R.; Francis, H.; Mann, J.M. ; Bila, K.M. et al. Persistent diarrhoea strongly associated with HIV infection in Kinshasa, Zaire. A.M.J. Gastroenterol 1987; 82: 859-864. 3. Nigerian Bulletin of Epidemiology 1992; 2 (1): 1-24. 4. Anteyi, E.A. ; Idoko, J.A. ; Ukoli, C.O. ; Bello, C.S.S. Clinical Pattern of Human Immunodeficiency Virus (HIV) infection in pulmonary tuberculosis patients in Jos, Nigeria. Afr. J. Med. Sci. 1996; 25: 317-321. 5. Habib, A.G.; Onyemelukwe, G.C. ; Kangare, D. Clinical presentation of HIV infection in Northern Nigeria and its relationship to CD4+ T-cell counts. Nigerian Medical Practitioner 1998; 35: 3-8. 6. Lucas, S.B. AIDS in Africa - Clinicopathological consequences. A.M.J. Trop. Med. Hyg. 1988; 38: 801-802. 7. Jacobs, J.; Gold, J.; Murray, H.; Roberts, R. et al. Salmonella infections in patients with the acquired immunodeficiency syndrome. Ann. Intern. Med. 1985; 102: 186-188. 8. Kotler, D.; Gaetz, H,; Lange, M.; Kein, E. Immunodeficiency Syndrome. Ann. Intern. Med. 1984; 101: 421-428. 9. Keptcheu, D.L. ; Elekwa, D.; Ikeh, E.I. Prevalence of Intestinal Parasites in Human Immunodeficiency Virus (HIV) patients in Jos, Nigeria. J. Med. Lab. Sci. 2000; 26-29. 10. Lumb, R.; Hardiman, R. Isospora belli infection. A report of two cases in patients with AIDS. Med. J. Aust. 1991; 155: 194-196. 11. Eaftrinck Schatten; Kerk, J.K.; Vangool, T.; Vanketel, R.J. et al. Clinical significance of small intestinal Microsporidiosis in HIV-1-infected individuals. Lancet 1991; 8755: 1488-1489. 12. Bodey, G.P. ; Fainstein, V.; Guervant, R. Infections of the gastrointestinal tract in immunocompromised patients. Annu. Rev. Med. 1986; 37: 271-281. 13. Connolly, G.M. ; Dryden, M.S. ; Shanson, D.C.; Gazzard, B.G. Cryptosporidial diarrhea in AIDS and its treatment. Gut 1988; 29: 593-597. 14. Allen, A.V.H. ; Ridley, O.S. Further observations on the Formol-Ether concentration technique for feacal parasites. J. Clin. Pathol. 1970; 23: 343-352. 15. Casemore, D.P. Laboratory methods for diagnosing Cryptosporidiosis. Broadsheet 128. J. Clin. Pathol. 1991; 44: 445-451. 16. Ramakrishna, B.S. Prevalence of intestinal pathogens in HIV patients with diarrhoea: implications for treatment. India J. Pediatr. 1999; 66 (1): 85-91. 17. Tarimo, D.S. ; Killewo, J.Z. ; Minjas, J.N. ; Msamanga, G.I. Prevalence of intestinal parasites in adult patients with enteropathic AIDS in North Eastern Tanzania. East Afr. Med. J. 1996; 73 (6): 397-399. 18. Merlin, M.; Gandara, S.; Lannicillo, H.; Dutacko, A. et al. Acute and chronic diarrhoea in AIDS: Study of 435 (HIV+) patients in Buenos Aires. Acta-Gastroenterol-Latinoam. 1996; 2 (1): 15-22. 19. Mohammed Awole, Solomon Gebre-Selassie, Tesfaye Kassa, Gebre Kibru. Prevalence of intestinal parasites in HIV-infected adult patients in South-Western Ethiopia. Ethiop. J. Health Dev. 2003; 17 (1): 71-78. 20. Valasquez, J.; Bessaso, H. Caballero, A.; Masim, R. et al. Opportunistic parasitic infections in AIDS patients with chronic diarrhoea. Int. Conf. AIDS 1996; 2: 449. 21. Cotte, L.; Rabodonirina, M.; Piens, M.A. ; Perreard, M. et al. Prevalence of intestinal protozoans in French patients infected with HIV. J Acquir Immune defic Syndr 1993; 6 (9): 1024-1029. 22. Oyerinde, J.P.; Odugbemi, T.; Benson, R.I.; Alonge, A.A. et al. Investigation of Cryptosporidium in relation to other intestinal parasites at the Lagos University Teaching Hospital, Lagos. West Afr. J. Med. 1989; 8 (4): 264-269. 23. Nwokediuko, S.C.; Bojuwoye, B.J. ; Onyenekwe, B. Apparent rarity of Cryptosporidiosis in Human Immunodeficiency Virus (HIV)-related diarrhea in Enugu, South Eastern Nigeria. The Nigerian Postgraduate Medical Journal 2002; 9 (2): 70-73. 24. Ikeh, E.I. ; Obadofin, M.O. ; Brindeiro, B; Baugher, C. et al. Intestinal parasitism in Magama Gumau rural village and Jos township in North Central Nigeria. Nigerian Postgraduate Medical Journal (Accepted). 25. Fisseha, B.; Petros, B.; Wolde, M. Cryptosporidium and other parasites in Ethiopian AIDS patients with chronic diarrhoea. East Afr. Med. J. 1998; 75 (2): 100-102. 26. Medico, G.; McDonald, J.; Gilman, R.H.; Cabrera, L. et al. Epidemiology and treatment of Cyclospora cayetanensis infection in Peruvian children. Clin. Infec. Dis. 1997; 24: 977-981. 27. Farthing, M.J.; Kelly, M.P. ; Veitch, A.M. Recently recognized microbial enteropathies and HIV infection. J. Antimicrob. Chemother. 1996 May; 37 Suppl B: 61-70. 28. Bryan, R.T. Microsporidiosis as an AIDS-related opportunistic infection. Clin Infect Dis 1995; 21: 562-565.